Hey there! Black Friday and Cyber Monday are in full swing! While your customers are hunting for the greatest bargains we have an EXCLUSIVE OFFER for YOU as well. During the greatest shopping days of the year SAVE 15% with Cart2Cart! 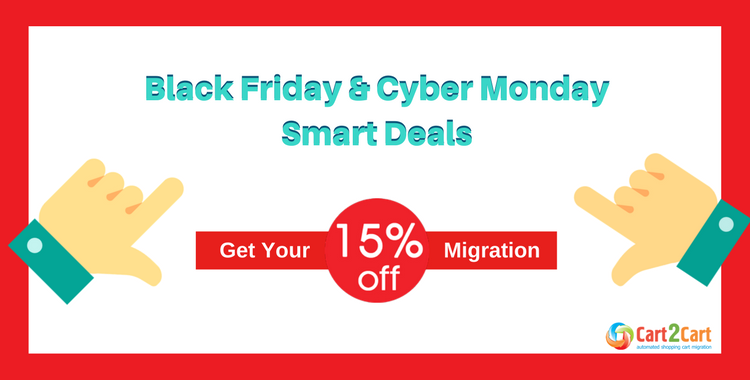 Save on replatforming by setting up the FULL Migration from 24 till 27 November using special Black Friday/Cyber Monday 15% OFF Coupon Code. Insert the Coupon Code bf-o0v0s9n07 right after performing the FREE Demo. Hurry up to grab your special offer! You’ve proposed great discounts to your clients, now have a treat yourself - turn your robust dream store into reality!!! Start with FREE Demo NOW! 4 thoughts on "Black Friday & Cyber Monday Smart Deals - GET 15% OFF!" I just want to mention I am new to weblog and truly liked you’re web page. Very likely I’m want to bookmark your blog . You amazingly come with awesome well written articles. Kudos for sharing with us your website page. I’d must examine with you here. Which isn’t one thing I usually do! I take pleasure in studying a submit that will make individuals think. Also, thanks for permitting me to remark! Hi, thank you for the commentary. We are waiting for more feedback from you. Hope you’ll share the posts you like most of all.